Last week ushered in a bit of excitement into Fed watching, with cross currents from the Fed minutes and the employment situation report. Unless the swoon in Average Hourly Earnings - pictured above - causes a re-think at the Fed, we have bond market pricing and Fed messaging pointing in opposite directions. Forward guidance, R.I.P. Fed Warns: We're Coming For Your Bond Yields! The Fed has spent a great deal of time developing models that back out what outcomes are priced into fixed income markets. They have developed quite complicated systems to remove risk premia that they believe affect market pricing. * They also have endorsed academic theories that the Fed, in its role as a "benevolent central planner"** can move those market expectation using communication policy ("forward guidance"). 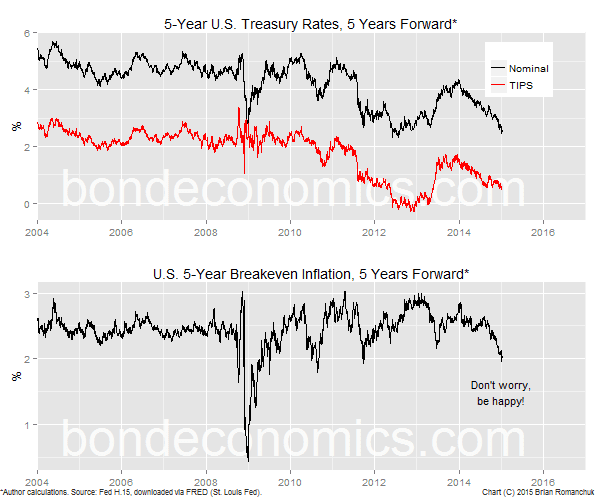 The chart below shows the fall in 5-year/5-year forward inflation breakeven inflation (that is, what the markets discount for a 5-year breakeven inflation rate starting 5 years in the future; also see my primer describing breakeven inflation). Since the forward date is so far ahead, it should not be affected by the fall in oil prices now. Instead, it is a measure of whether the market is confident that the Fed can keep inflation near its target level in the long term. Survey-based measures of longer-term inflation expectations remained stable, although market-based measures of inflation compensation over the next five years, as well as over the five-year period beginning five years ahead, moved down further over the intermeeting period. Participants discussed various explanations for the decline in market-based measures, including a fall in expected future inflation, reductions in inflation risk premiums, and higher liquidity and other premiums that might be influencing the prices of Treasury Inflation-Protected Securities and inflation derivatives. Model-based decompositions of inflation compensation seemed to support the message from surveys that longer-term inflation expectations had remained stable, although it was observed that these results were sensitive to the assumptions underlying the particular models used. It was noted that even if the declines in inflation compensation reflected lower inflation risk premiums rather than a reduction in expected inflation, policymakers might still want to take them into account because such changes could reflect increased concerns on the part of investors about adverse outcomes in which low inflation was accompanied by weak economic activity. In the end, participants generally agreed that it would take more time and analysis to draw definitive conclusions regarding the recent behavior of inflation compensation. Translation: as soon as the market is hinting that the FOMC is failing in their job, it is just risk premia changing. A couple of participants remarked on the apparent disparity between market-based measures of expected future U.S. short-term interest rates and projections for short-term rates based on surveys or based on the median of federal funds rate projections in the SEP. One participant noted that very low term premiums in market-based measures might explain at least some portion of this gap. Another possibility was that market-based measures might be assigning considerable weight to less favorable outcomes for the U.S. economy in which the federal funds rate would remain low for quite some time or fall back to very low levels in the future, whereas the projections in the SEP report the paths for the federal funds rate that participants see as appropriate given their views of the most likely evolution of inflation and real activity. In other words, bond market pricing appears delusional, at least with respect to the Fed's base case scenario. During the 2004-07 period, the (Fed) tightened monetary policy nearly continuously, raising the federal funds rate from 1 percent to 5.25 percent in 17 steps. However, during this period, 10-year Treasury note yields did not rise much, credit spreads generally narrowed and U.S. equity price indices moved higher. [...] As a result, financial market conditions did not tighten. [...] With the benefit of hindsight, it seems that either monetary policy should have been tightened more aggressively or macroprudential measures should have been implemented in order to tighten credit conditions in the overheated housing sector. [...]When lift-off occurs, the pace of monetary policy normalization will depend, in part, on how financial market conditions react to the initial and subsequent tightening moves. If the reaction is relatively large—think of the response of financial market conditions during the so-called “taper tantrum” during the spring and summer of 2013—then this would likely prompt a slower and more cautious approach. In contrast, if the reaction were relatively small or even in the wrong direction, with financial market conditions easing—think of the response of long-term bond yields and the equity market as the asset purchase program was gradually phased out over the past year—then this would imply a more aggressive approach. This language should encourage the long-suffering Treasury bears; at least some members of the FOMC consider the entire yield curve as determining the stance of interest rate policy, and so another "conundrum" (long rates not moving as short rates are hiked) would be unacceptable. They have no concerns about the hardships faced by one sector of the economy (the oil sector) if there are offsetting benefits elsewhere. They do not care about the cost of interest payments on the Federal debt. Spread widening in the high yield market does not matter, so long as the primary market (that is, bond issuance) remains open. As long as credit remains available at some price, they do not care if it is more expensive. Risk premia were probably "too low". In summary, the FOMC appears to be sliding towards the view that the rally in Treasury bonds has reached levels that are just plain nuts. My view already is that the Fed is too optimistic on the labour market, so I do not want to wallow in confirmation bias here. But there are at least a couple of reasons why the Fed needs to take the message in bond yields seriously. The fall in average hourly earnings, as pictured at the top of the article, has been impressive. The Fed would not hike rates before "mid-year", and so they will have access to more data before hiking. 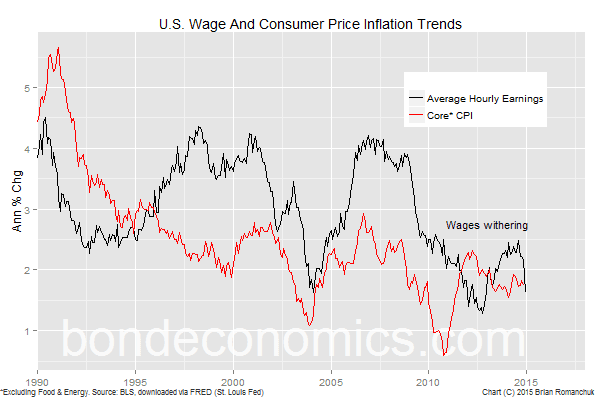 But if the weakness in wages continues, there is almost no justification for a rate hike. Although headline writers get excited about hundreds of thousands of jobs being created according to the Nonfarm Payrolls report, the employment-to-population ratio does not give signs that there is risk that momentum in the labour market will overrun spare capacity (chart below). 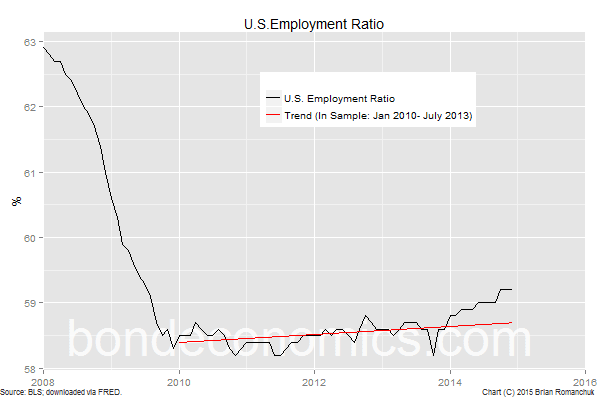 There had been an acceleration in 2014, but the ratio flatlined in the fourth quarter. Unless the U.S. economy does fall into recession in 2015, it is highly possible that the real excitement will hit in 2016, one way or another. It would be a guess on my part as to what would happen that at that point. Since I do not give investment advice, all I can do is offer conditional counsel. If the reader is optimistic at all about the United States economy, you do not want to own the 10-year Treasury with yields below 2%. If the reader is cautious about the economy, curve trades (notably conditional curve trades) are presumably the way to go. If you are bearish on the economy, call up your JPY trading contacts to get ideas for receiver swaption strike levels. * In my view, those models are generally misleading, and people should only have very simple models with stable risk premia. However, that would mean that researchers would no longer be able to publish articles describing complex risk premium models, and we can't stop the publication flow, can we? ** No, that's not a description from outraged Austrians, that's what they call themselves in the DSGE literature. *** If you believe that Quantitative Easing had an important effect on bond yields, it is clear that the stock of holdings matters, and not the flow. Additionally, there are "long and variable lags". One could try to make up a story about expectations, but the attempts to do that which I have seen were basically exercises in circular logic.